Do a quick Google search for Chrome extensions for blogger productivity and you’ll come up with a very long list, I’m sure. I could probably give you a pretty long list myself. However, today I’ve decided to only share my top 10. These are the top 10 Chrome extensions for blogger productivity I most frequently use. That’s not to say they’re the only extensions installed on my browser. They’re just the ones that see most of the action. Let me tell you how they help me stay focused and productive as a blogger. When I first decided to start blogging, I didn’t expect that it would be so much work. I also didn’t anticipate all the time that it would require. Trying to manage it all, I quickly learned that to run a successful blog I needed to stay focused and have a game plan to increase my blogger productivity. The Chrome extensions I’m about to share with you are part of my game plan. The beauty of it is that I can get many of my blogging tasks done without ever leaving my browser. 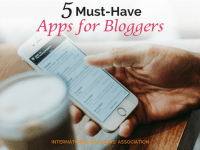 I now get more done in a shorter period of time, therefore increasing my blogger productivity. If you’re not already using these, give them a try! I think you’ll love them as much as I do. This simple and convenient tool allows you to capture an entire page or select an area from any page on the web. It also lets you edit your screenshot and save it to your desktop or any other destination you choose, even the cloud. The simple interface makes it one of the fastest ways to take a customizable screenshot — annotate, draw, crop and save as a PNG. To give you an idea here’s a screenshot I took from the Chrome Web Store using the Lightshot Chrome extension. Here you can see the available editing tools and options to save and share on the toolbars to the right and under the selection. Notice how I was able to add an arrow, draw a box and add text to this screenshot before saving it. Pretty cool, right? The Buffer Chrome extension is one of the smartest ways to share content on your social media accounts (Twitter, Facebook, LinkedIn, Google+) from anywhere on the web. Once installed, just click the Buffer extension icon to share a web page on the spot or add it to your Buffer queue. It’s one less thing to worry about! If you aren’t already not using Buffer, what are you waiting for? 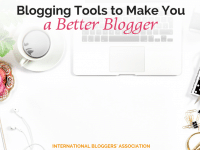 The IBA recently featured a post that explains exactly how Buffer can help you as a blogger. Click here to read it and learn more. Disclosure: I, Monica Encarnacion, receive commissions for purchases made through the link(s) in this post. See full disclosure here. Social media promotion is one blogger task that shouldn’t be overlooked! Here’s another Chrome extension that will help you share content without spending loads of time. If you’re already a CoShedule user, good for you! You’re on the right track! Now just make sure you download the CoSchedule Chrome extension. The CoSchedule Chrome extension can help you share articles, quotes, and links on your social media channels without ever leaving your browser. 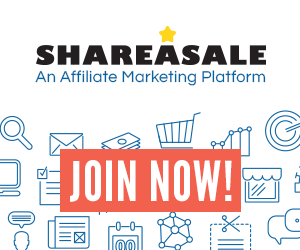 It will extend the functionality of your existing CoSchedule calendar and help you optimize shares across your social media channels. I won’t go into a bunch of details about CoSchedule but if you want to learn more about how to use it, I highly recommend you check out the CoSchedule blog. There you’ll find great tips to help you optimize your content and grow as a blogger. You can check out the CoSchedule blog here. In the end, you want to increase your productivity by planning ahead as much as you can. 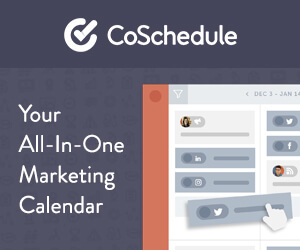 The CoSchedule Chrome extension is a great way to do just that! With over 100 million web pages out there, one of the easiest and quickest ways to discover quality content is through StumbleUpon — access streaming videos, beautiful photographs and interesting websites. All you have to do is enter all the interests/topics that you like and then click the Stumble button. A list of great recommendations will pop-up. The StumbleUpon Chrome extension makes it super simple to use this tool — no need to open up an extra tab to access the StumbleUpon website. You can just click on the StumbleUpon icon that will appear at the top of you browser window once installed. A toolbar will appear at the top of your browser. Now you’re ready to discover, like and share new content anytime with StumbleUpon. Easy-peasy! StumbleUpon is also a great tool to help you share your own content. It can help generate loads of new traffic to your blog or website when used properly — yes, there are key rules you must follow for this to actually work for you. But when done right and consistently you’ll be astonished by the results. I’ll tell you that in the past 6 months StumbleUpon has brought steady traffic to my blog. And in the past month alone I’ve been able to generate three times my usual blog traffic by sharing just one of my recent blog posts through StumbleUpon. 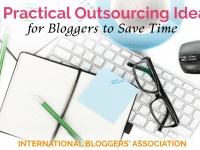 Talk about blogger productivity! StumbleUpon is a tool that every blogger needs to know about! If you’re not already using it, you’re missing out. Plus, the StumbleUpon Chrome extension makes it even easier to use! As bloggers, we’re always trying to beat the clock. Always trying to meet deadlines or squeeze in some extra work between other personal responsibilities. There’s just never enough hours in a day! If we fail to monitor the time we spend on each of our blogging tasks, then we’re less likely to accomplished everything in a timely manner. The Simple Time Track Chrome extension can help! Always running in the background, the Simple Time Track extension allows you to add multiple tasks and keep track of the time you spend on each, right there on your browser. This is how I ensure that I’m spending my time wisely and staying focused when working on blogging tasks. Distractions can be a blogger’s worst enemy! StayFocused is a must when it comes to Chrome extensions for blogger productivity. How many times have you sat at your computer, planning to be totally productive, only to find yourself distracted by social media pop-ups that can’t seem to wait? Or maybe you wandered off to some website that sucked the time right out of you before you even realized it? Before you know it, you’ve completely diverted away from the task at hand! It’s now 2 hours later and all you’ve accomplished are Facebook status updates, some retweets and a couple of unrelated Google searches, such as ‘where to go on your next dream vacation?’ — you’re not even a travel blogger! Can you relate? StayFocused is one of the best Chrome extensions for blogger productivity! It allows you to restrict the amount of time you waste on the online activities you choose. Once you’ve set it up, the allotted time will reach the dial and the blocked sites (which you’ve set up) will be inaccessible for the rest of the day. This will surely limit the time you spend on those endless social media scroll sessions which I know you’re struggling to keep under control — let’s be real! I have my social media sites under restricted use. Otherwise, I’d get nothing done! This neat little extension is one I can’t live without! It checks grammar, spelling, and vocabulary when you write anywhere online — on your blog, in an email, on your social media accounts, ANYWHERE while on the web. It helps me find writing mistakes I’ve overlooked. It helps correct spelling mistakes, suggests grammatical changes and makes a lot of other awesome suggestions to make me a better writer. Check out how others are using it here. You must try it too! This nifty tool lets you count the number of words and characters in a selected text. Just select a paragraph or even a full web page, and click the option “Word Count Tool” on the right click context menu. It will show you the total number of words and characters. Also the number of sentences, paragraphs, average sentence length and word length. This comes in handy when working on a blog post or even when I’m conducting a little research on what’s working for the competition. Have you ever wondered how well other blogs within your niche are doing? Ever wondered what kind of traffic those blogs are generating or how they’re generating that traffic? One way I like to check out what’s working for others is by using the Follow Chrome extension. Now, some might consider this a bit stalk-ish, but I see it as part of my research for growth. This neat little tool allows you follow other websites and gives you access to a ton of important SEO metrics and other data. This can help you learn more about what others within your niche are doing and how they’re doing it. I don’t really like to play the comparison game, however, I do find it interesting to see how I stack up when compared to other bloggers within my niche. It helps me set goals towards where I want to be and how I can possibly get there. By closely examining what other bloggers are doing I can get a better picture of what may or may not work when optimizing my own blog posts. We all know that SEO is important. I see this is as a way to take my own SEO a bit further! BONUS: Speaking of SEO — Check out this great SEO checklist shared by our very own IBA Vice President. To give you a clearer picture, I thought I’d share this short video that will walk you through what the Follow extension has to offer. Are you a OneNote user? I sure am! OneNote helps me gather my thoughts, organize and plan my content, keep track of passwords, affiliate links, and so much more. By using the OneNote Web Clipper Chrome extension you can save anything on the web to OneNote. 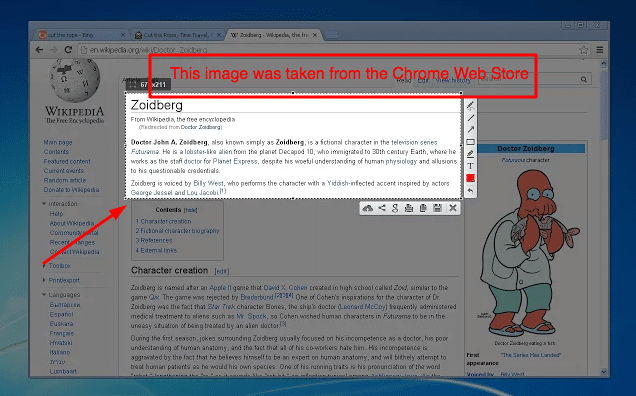 The OneNote Web Clipper Chrome extension allows you to quickly capture any web page to OneNote. Clip an article, recipe or any product information you really need, easily edit, annotate, and save it. It doesn’t get much easier than that! 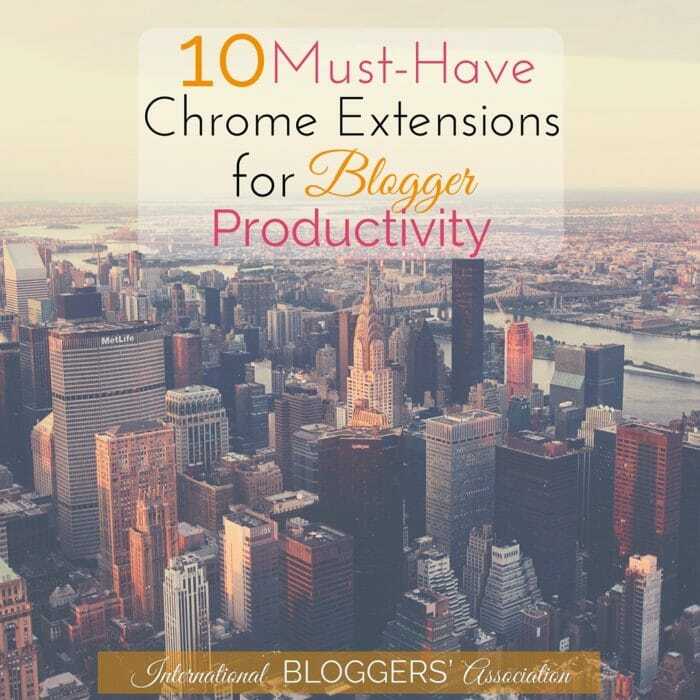 So there you have it — My list of 10 Must-Have Chrome Extensions for Blogger Productivity! 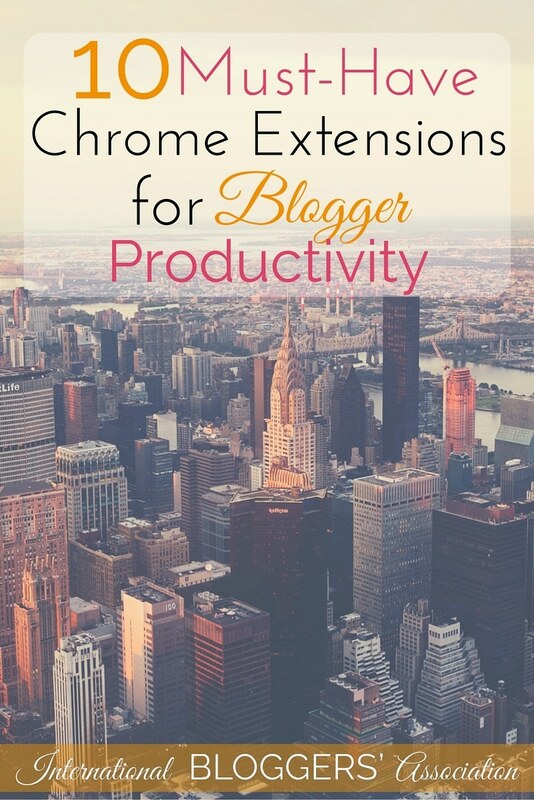 Do you have your own list of must-have Chrome extensions for blogger productivity? Would love to hear them! The more the merrier, so please share in the comments section below.